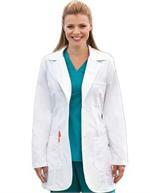 Put your best foot forward and look more than the part with our fashionable and functional Grey's Anatomy Lab Coats! These lab coats take their looks directly from the screen, reclaiming medical industry image from the hit TV show. Our Grey's Anatomy white lab coats feel as good as they look. That's because white lab coats are licensed and created by Barco Uniforms™, one of the biggest names in the medical attire industry. Their superior materials also clean amazingly well, ensuring your uniform looks picture-perfect no matter what your rounds throw at it. For the most affordable, high quality lab coats, choose ScrubsUnlimited.com. To learn more about our Grey’s Anatomy Lab Coats and Grey’s Anatomy Scrubs, call us toll-free at 866-267-3079. Finding the right lab coat size is essential. Measuring correctly can be very difficult when you’re shopping online though, which is why we offer our Safe Sizing Program.